One in three children in the United States are overweight or obese. The CDC reports that since 1980 obesity prevalence among children and adolescents has almost tripled. So what is being done to stop this? Well, some of the most influential stakeholders came together in Washington last month to actively discuss innovative ways to reverse the rising trend of childhood obesity – and guess who volunteered their time at this conference? You guessed it. As a chubby kid myself, I have more than just a casual interest in the subject. As a young adult I started to get interested in the food that I ate and how it affected my health. I even had the honor to work for the Alliance for a Healthier Generation a few years ago, one of six founding members of the Partnership for a Healthier America. At this first of its kind summit I was charged with being a facilitator for a breakout discussion about how the private sector can help reduce current barriers that negatively affect young people’s ability to participate in before and after school activities. Cash-strapped schools generally don’t have the means to provide transportation for students to either arrive earlier or go home later if kids choose to participate in sports and extra curricular activities outside of school hours. I participated in several preparatory meetings and phone calls, read numerous articles and opinions on the subject and took off work to volunteer at the two-day conference. As it turns out though this is either not really a problem or in fact it is such a conundrum that people truly don’t know where to begin. I say that because only one person out of the more than 700 attendees showed up to the session! “I don’t know much about these challenges and thought this could get me up to speed,” she told me as she sat alone in a sea of chairs that I had formed into a large circle. 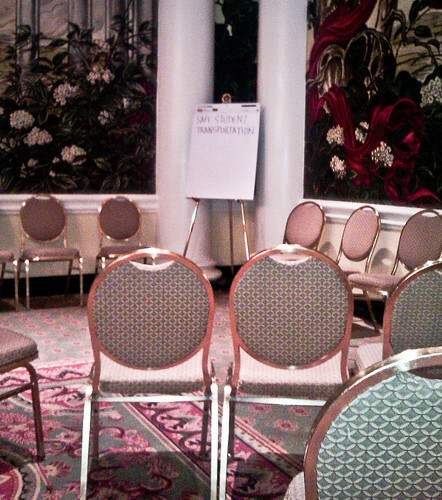 We decided not to hold the session given the turnout and our brave attendee joined another session. Besides my rather anticlimactic session, I enjoyed the two-day experience and was particularly energized by the collective expertise and brainpower they managed to bring together. On top of that, there were memorable moments by tantalizing speakers such as First Lady Michelle Obama and Newark, NJ Mayor Corey Booker not to mention an entertaining and educational dinner program which challenged James Beard Award-winning chefs Tom Colicchio, Maria Hines, Holly Smith and Ming Tsai to create dinner meals on a SNAP (food stamp) budget of $10! To learn more about this event and other resources to help reduce childhood obesity, check out the Partnership for a Healthier America or the Alliance for a Healthier Generation. Although his eyes seemed to dance around the room, I would later learn that Antoine was indeed paying attention. Seated at a small table on the third floor of Robert F. Wagner Middle School on New York’s East Side, the soon to be high school junior’s mind was aldreay dreaming of places far beyond the walls of room 302 this past Saturday. Antoine was attending Let’s Get Ready’s Career Day. It’s a day that gives a diverse mix of high school students the opportunity to learn about a variety of careers from about 50 professionals who volunteered their time to share their knowledge with more than 250 young people who attended. 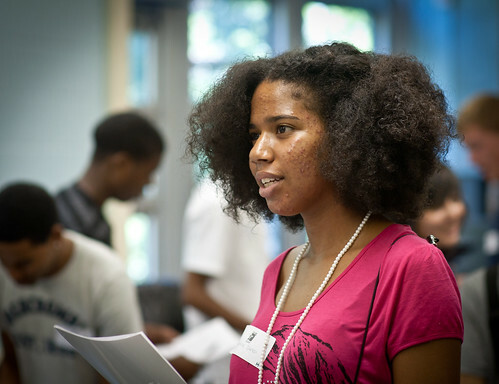 Founded in the summer of 1998 by Jeannie Lang Rosenthal, an undergrad at Harvard, Let’s Get Ready is a nonprofit organization serving communities in and around New York City and Boston whose mission is to expand college access for motivated, low-income high school students by providing free SAT preparation and college admission counseling. “You think that one day I could have a job like you,” the young man from west Bronx asked me after I finished my presentation. “What’s that mean?” I asked him trying to get a sense of how he was doing in school. The 16-year-old, whose real name I changed to Antoine for this article, is one of 3.1 million young people this year who will be faced with the decision of whether or not to attend college after high school. If you evaluate his situation based solely on drive, there is no doubt in my mind that he will go on to college. He’s thirsty to know more and asked several excellent questions during the seminar. I co-led a variety of sessions focused on helping the students understand their career interests through a personality assessment, interactive sessions about college, and tips on how to build and maintain a professional network so that they can land a job after college. Originally I was only to be a speaker at the half day workshop, however, when their photographer wasn’t able to make it, I offered to stand in and try to capture some visual images of the day as well. Click here to see the images I captured from Career Day. The thermometer nearly broke the century mark that afternoon and there was no air-conditioning in the room that I was assigned to. Exhausted and covered with sweat, I wrapped up my session and headed to the closing session in the main auditorium. I got the chance to meet and exchange business cards (Let’s Get Ready supplied the students with cards that they filled out to serve as business cards for the day) with dozens of tomorrow’s leaders. It was inspiring to talk with them and hear their dreams. After the event was over I stayed and spoke with several young people who patiently waited to introduce themselves to me. I hope they all keep in touch, I will be checking in on them periodically too to see how things are going. When the last student had left, I grabbed my bags and headed for the front doors. Now dim and voiceless in the school, the heavy metal doors rumbled as they gave way to a sun-drenched sidewalk filled with the sounds of the Big Apple. The success of Let’s Get Ready depends greatly on volunteers and donations. If you would like to support this organization and help prepare our next generation of leaders, please visit their website and get involved! Day 50 – Cheryl F.
Blog post by Stephanie, a Kindness Investor from Mt. Laurel, NJ. I created an intention this morning ~ Today, I am open! While I was at the bank, I overheard the teller next to me tell the young woman that she was in the negative. I had been there before and bounced a check, so her situation hit home for me. I wanted to hand her the $10 but she was with the teller, had a cell phone call on hold and her mom was waiting for her in the car. Honestl y, the scenario to give her the money at that moment didn’t seem like an open opportunity so I left the bank and ventured off. I went to Panera for lunch, thinking this was a perfect place to meet a YOGI, but the place seemed crowded, busy and sadly the people felt closed off to making connections with a stranger. I left and later set out to Whole Foods. I was aware that it still seemed difficult to even make eye contact with people. Everyone seemed to be in a hurry. The customers seemed to be looking in their wallets, talking on their cell phones or focusing on where they were going next. I was let down for a moment and felt she really wanted to protect her child. I have always promoted Kindness in schools and enjoy connecting with children. People tell me I have a natural gift for this, but I didn’t realize how challenging it is to connect with people I don’t know who are going about their everyday routines and schedules. Feeling like I may fail myself and not find someone to connect with, I looked over at the last register and watched a middle-aged woman tap a man on the shoulder and point to a bill on the ground. I believe it was only a dollar bill, but I observed this woman’s kind gesture. The man was not even aware that he dropped money, but picked it up and graciously thanked the woman. After the woman paid for her salad, I approached her smiling and gave her the $10. 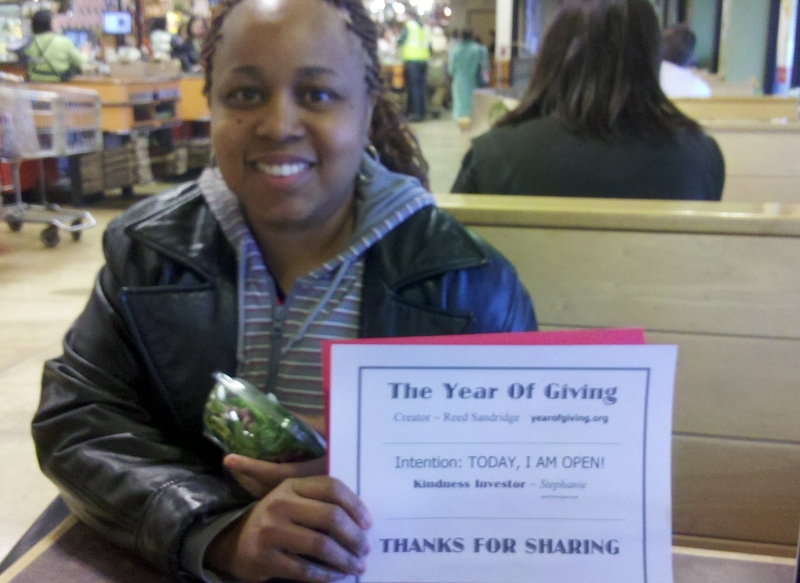 I said I observed her gesture and that I would like to give her $10 as part of the Year of Giving. She was shocked and surprised, so I started our conversation by explaining just what YOG was. Cheryl F. accepted the $10 and told me she is the mother of four teenage girls ages 12, 14, 16 and 18. She said the hardest thing about being a mother was how close in ages her girls are and wished daily responsibilities did not get in the way of her spending more time with them. Cheryl works as a Home Health Aide and helps serve the elderly. She shared how our elderly are a lot like children – needing lots of care and attention, too. She said she enjoys her job and helping other people out. When I asked how she will use the money, Cheryl said, “I will hold on to it and then pay it forward!” She wanted to tell her daughters about what happened today. I thanked Cheryl for sharing her story and for being so kind. Cheryl was warm, friendly and cares about her daughters and the elderly! The Sustainable Organization for Community Peasant Laborer Student Development and Orphans (SOCPLSDO), a non-profit, non-governmental, non-political organization, was established in 2006 by Mr Pong Sena. The SOCPLSDO established the Chres Village School and Orphanage in the same year for the regional orphans, students, laborers and peasants from the villages in and around the district of Bakong of the Siem Reap Province, Cambodia. The aim of the SOCPLSDO is to alleviate the poverty and difficulties of the orphans and children of poor families in the Bakong district providing support of their basic needs such as food, clothing, education, accommodation, health services and school supplies. More than 50% of the Cambodian population is less than 21 years old. The population lacks education and productive skills, particularly in the poverty-ridden countryside, which suffers from an almost total lack of basic infrastructure. I went over my $10 today, but it was my pleasure to give my temporary English students the help they needed for each of them to buy school supplies, toothbrushes and toothpaste. A few days ago while speaking with Reed on the phone I was telling him about my dog Max being a Therapy Dog. Later that day Reed saw a news story about a service dog that helps an autistic child. The dog was trained through a group called 4 Paws for Ability. Very ironic because 4 Paws for Ability is located in Xenia, Ohio where I’m currently living. Reed had no idea of this at the time. I’ve lived in Xenia for almost a year and a half, drove past 4 Paws for Ability several times but never actually stopped to check it out. I decided I should head over to 4 Paws for Ability and donate $10 to a volunteer there. I gave the money to Charlene who in turn donated the money to 4 Paws for Ability. Charlene showed me around the facility and introduced me to quite a few dogs. In total 4 Paws for Ability has 200 dogs but they are not all living at the facility. Some of the dogs live at a Correctional Facility where the inmates there train the dogs, other dogs are living with foster families. 75% of the dogs at 4 Paws for Ability are rescued from animal shelters, I thought this was just amazing. After working with the dogs if a dog just doesn’t seem like it will be a good service dog they place the dogs on PetFinder.com. All dogs placed on Pet Finder have went through extensive obedience training so you get a fully trained dog. 4 Paws for Ability has designed the inside of the facility to resemble a home. They have an area in the facility which is set up like the living room in your home. This area has toys, television with video games and a computer. The area is somewhat barricaded and was designed for children who are getting a service dog to be able to spend a day in a home like setting with just them and the dog as the parents view the interactions from outside the area. Outside the building is a 2 acre area which is sectioned off into different yard type areas for the dogs to play. Outside I was greeted by Connor who is currently going through training. Connor was playing in the area which was made up to look like a typical backyard area with swings and play-sets. During the warmer months the children can spend time outside interacting with the dog. If it weren’t for participating in the week of giving I may have never walked into 4 Paws for Ability. Thanks to this opportunity I may have just found an additional opportunity to volunteer. 4Paws for Ability has ongoing needs for donations. Day 336 – Antoine B.
I just got home from work, kicked my shoes off and scanned around my messy apartment. This week has been crazy and I have kind of let things get out of control around here. Well, I have blocked off this weekend to get things done, so hopefully that includes getting things straightened up. Day 336 was November 15th which was a Monday night. On that night a tragic murder was committed here in Washington. The Redskins fell victim to the Eagles 59 – 28. But before the horrific slaughter, the parking lots were full of jubilant and hopeful fans who were still gossiping about the earlier news of the day that the Redskins extended Donovan McNabb’s contract for five years. The deal pays McNabb 78 million dollars over five years with a guaranteed amount of 40 million. Shoot, maybe I should be asking McNabb for some financial support for my Year End Celebration! Antoine gave $3 to his friend and said he was going to save the rest. Anyway, I told my buddy Chris that he could choose the recipient of the day but that his wife had veto power. Well, this didn’t go very well. Chris kept picking people that Beth didn’t approve of. Until Chris drug 11-year-old Antoine over in front of her to be inspected and she approved. Antoine was a sixth-grader who was selling candy to raise money for at risk youth in the DC area according to a gentleman accompanying Antoine who didn’t identify himself. “I’ve got caramel hearts, peanut butter crisps, peanut brittle, green tea,” Antoine began to tell me. What would you like? I explained that he didn’t need to give me anything in return for the $10 and that he could just add that to his collection. I set up my camera while I asked some more questions to Antoine. He told me that he had sold 12 boxes and that he had 7 more to go. That's Antoine in the middle with his crate of goodies. This was a weird exchange. Our conversation was awkward and I didn’t feel good or bad about it, just ambivalent. I thought about it for a while even after Antoine was long gone and I was comfortably sitting in my covered seat in the stadium. I wondered if he had ever come inside to see a game. Probably not. As I said earlier, the game went on to be a disaster. It poured rain for all of the second half and the score looked more like a basketball game than it did a football game. The Redskins played awful. I think 11-year-old Antoine could have played better than several of the guys that night – he would have played his heart out just be on the field.